What is better on a hot summer day than cold soup? 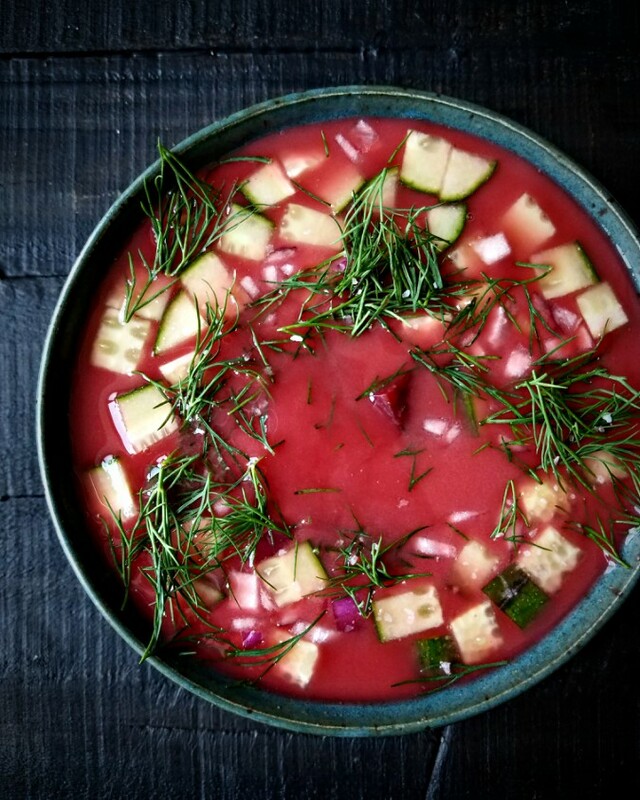 Of course I can think of a few things, but a bowl of Cold Borsch is not only beautiful, low calorie, and satisfying, but is also nutritious, can be made a few days ahead, and is quite versatile. I wrote about making Cold Borsch a while back, but made a variation on that recipe yesterday in honor of my dad because he's the king of borsch! I started the night before by cooking peeled and diced beets in plenty of salted water. I separately cooked a few diced potatoes in salted water. Once the vegetables and the liquids were cool, I drained the potatoes and added them to the cooked beets and the beet liquid. The next day, I added Greek Yogurt, diced cucumbers, diced red onion, and plenty of chopped dill to the soup. I used Greek yogurt instead of buttermilk, because I already had it in my refrigerator. If you use buttermilk, you'll probably have plenty of leftovers. Don't worry: I have plenty of recipes for you that include buttermilk. Everything from appetizers, to main courses, to dessert! You can also add hard boiled eggs, radishes, other herbs such as basil, and wilted spinach!